"Behold, wonderful thing! I glide down from the upper world in a bucket, / thus hanging, I am brought all the way to the dark shadows of death. / But, as I moved to and fro hanging in the middle of the air, / it was pleasant for me to sing holy hymns" (Swedenborg, Ludus Heliconus). "He sat down on the bench beside Elis, and began to describe the various processes minutely, placing all the details before him in the clearest and brightest colours. 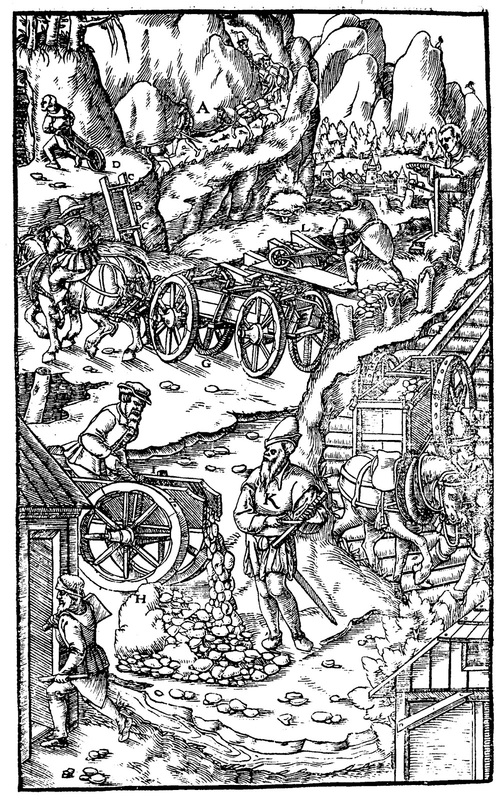 He talked of the Mines of Falun, in which he said he had worked since he was a boy; he described the great main-shaft, with its dark brown sides; he told how incalculably rich the mine was in gems of the finest water. More and more vivid grew his words, more and more glowing his face. He went, in his description, through the different shafts as if they had been the alleys of some enchanted garden. The jewels came to life, the fossils began to move; the wondrous Pyrosmalite and the Almandine flashed in the light of the miner's candles; the Rock-Crystals glittered, and darted their rays. Elis listened intently. The old man's strange way of speaking of all these subterranean marvels as if he were standing in the midst of them, impressed him deeply. His breast felt stifled; it seemed to him as if he were already down in these depths with the old man, and would never more look upon the friendly light of day. And yet it seemed as though the old man were opening to him a new and unknown world, to which he really properly belonged, and that he had somehow felt all the magic of that world, in mystic forebodings, since his boyhood. 'Elis Froebom,' said the old man at length, 'I have laid before you all the glories of a calling for which Nature really destined you. Think the subject well over with yourself, and then act as your better judgment counsels you."' (E.T.A. Hoffman, The Mines of Falun). als wär' sie seine Braut. sie läßt ihm keine Ruh'. strahlt ihm ein ew'ges Licht. tun ihre Schätze' ihm auf. und bleibt mit Freuden arm. der frohe Herr der Welt. further reading: Mareike Henrich, Im Bergwerk der Seele. Das Bergwerkmotiv in Novalis'Heinrich von Ofterdingen' und E.T.A. Hoffmanns'Die Bergwerke zu Falun' (2003); Noah Herigman, Romantic Rocks, Aesthetic Geology (2004); Catherine E. Rigby, Topographies Of The Sacred: The Poetics Of Place In European Romanticism (2004), 104ff.